In 2017 I challenged myself to complete 50 races in the year to mark a milestone birthday. I completed the 50 and did a few extra at the end as time allowed. Click here to see the 50 races I did. Back in the late 90's in an attempt to keep fit and trim I started going for brisk walks but I kept getting awful shin splints, so one day, I started running to see if it was easier and it was. But then over the years as I increased my mileage and ran in many half marathons and road races, I began to get injuries, especially lower back pain and eventually I was advised by my doctor to stop. Reluctantly I did and was miserable! Looking back, I realise I didn't need to stop running, I just needed to improve my running technique. So, for over a year I stopped, but then as a milestone birthday approached I decided to challenge myself to run the New York City Marathon and went back out running. Typically, a couple of weeks before the marathon I got IT band syndrome and was told not to run with it, but being stubborn, I ignored PT advice and ran it anyway. A while later I was training for a triathlon and again got IT problems. It was extremely painful but I got through it, thankfully with no long term damage. In 2008, shortly after the marathon and first triathlon I started wondering how I could run free from injuries, without pain and with little effort. 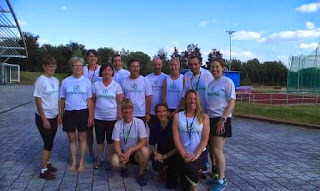 It was at this time that I was introduced to the Chi (pronounced 'chee') technique at one of Catherina McKiernan Chi Running workshops and started to implement it into my running. Since then I haven't looked back and found both my walking and running transformed to a whole new level. 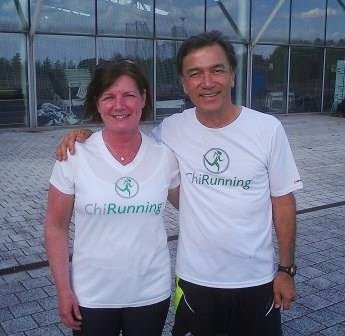 I was so blown away by the Chi Technique that I decided I wanted to share it with others, who like me, (in my pre-ChiRunning days), suffered from injuries, pain and inefficient running. I only wish I found the technique sooner, but 'better late than never'! So in 2010 after two years practicing the technique I travelled to America and completed the rigorous Chi Instructors Training Course and became a Certified ChiRunning and ChiWalking Instructor. I have to say in my early years of running I found it pretty hard but since learning the chi technique I enjoy running because it's easier, fluid, efficient, injury free (big bonus for me - no more sore back, shin splints or IT band), no post-run recuperation and like before it's refreshing, a great de-stresser, keeps me trim and toned, it's no longer a chore and is great for clearing my mind! So the chi technique works for me!